September 30, 2016, Dayton, OH – Prime Controls, a leading manufacturer of double metal sheet sensors and controls for the can making, automotive, appliance and other metal forming industries, is pleased to announce the unveiling of their newest product, the DS600, which expands on their current world-leading Double Sheet Detection Controls offerings. 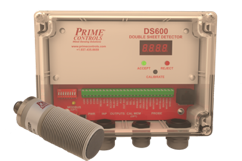 The DS600 control paired with a non-contact, single probe sensor detects non-ferrous metals (such as 300 Series Stainless Steel and Aluminum) with thicknesses ranging from .025mm-3.81mm (.001”-.150”). By measuring the effects of eddy currents on the non-ferrous metal near its face, the DS600 is able to detect the metal thickness and prevent double sheets or improper thicknesses from entering machines – ultimately diminishing costly repairs and downtime. This is especially important for automotive metal stampers, where the industry is utilizing more and more non-ferrous metals to reduce the weight of vehicles. Unlike other single probe double sheet detectors on the market, the DS600 system does not need to make contact with the metal it measures helping to avoid surface defects to the product. Housed in an IP65-rated enclosure, the DS600 unit is thoroughly protected in the typical shop floor environment. This system is well suited for automation applications such as robotics, automated de-stackers, sheet feeders and in-fixture (Poke-A-Yoke) where sensing from only one side is possible. The release of the DS600 will include three versions of the control to better suit the manufacturer’s needs. The basic DS600 model is geared towards applications where the need for simply detecting whether a single or double is present is the main objective. For applications that require additional features and functionality, the DS600 Premium is available. A hands-off product, the DS600 Premium offers eight-slot calibration memory, easily selected through discrete I/O, for quick change-overs with no recalibration required. This model also provides threshold adjustments and variable timing during the detection process for better gauging of metal thickness and more defined. With the growing demand for communication capability among the system controls and customer’s PLCs, the DS600 PremiumPLUS features industrial communications in addition to 64-slot calibration memory and memory backup to ensure the users receives the most out of their system. “We are extremely excited about the launch of the DS600. It’s a product we have spent time on developing and fine-tuning to ensure it meets the customer’s needs.” states Beth Graves, President of Prime Controls. “We are eager to introduce this product to the automation industry where the need for a non-contact single probe double sheet detector is essential, continues Graves.